Raksha Bandhan is on 26th August and from common men to celebrities, everyone is gearing up for this special day. Very few people know that the ‘Baaghi 2’ actress Disha Patani has a younger brother Suryansh. She took to her Instagram handle to share a video where she surprises her brother. Here’s the video below. 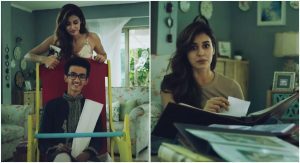 The video is shot for popular chocolate brand Cadbury and Disha promises to spend this Rakhi with her brother. Disha became an overnight sensation with ‘M.S Dhoni: The Untold Story’ (2016) and after that, she never looked back. Currently, she is prepping for ‘Bharat’ that has Salman Khan and Katrina Kaif. After Bharat, she will begin shooting for the Telugu film ‘Sanghamitra’. It’s a magnum opus and will be made on a huge budget and will take almost 2 years to shoot. Also, there are reports that she has signed ‘Baaghi 3’, which will go on floors next year. Coming back to the Rakhi video, what do you have to say on this? Share your comments in the section below.